Blocked and waiting for Annabelle’s final inspection — the Cedar Falling Waters shawl. It’s still pinned out on the floor this morning, and I’ll leave it there until I get home from work. It’s probably dry, but I know me; once I unpin it I’ll have to look at it, then put it on, then play with it …but it’s Monday, and I need to get to work. The light was so poor yesterday that the photo can’t show how shimmery the purl bumps are, or how the tilting things wave across the surface. And the colors — they are so cedar-y! While I watched the shawl dry I finished a pair of Sweet Fern mitts from The Knitter’s Book of Wool. I was knitting along on the second one, happily making the thumb increases, la-de-da hooray for me, when I realized I was making a second right-hand mitt. Oh well. When I posted about it on Facebook, I was pleased to learn that it happens to the best knitters sometimes! The yarn is Aarni from Riihivilla, a yarn which my friend Kris forced me to order. Its base is a blend of natural colors, and it’s dyed with indigo, so it’s a very interesting yarn. I popped the pair into a bath last night and they’re still drying, so I’ll try to get photos during the week. I also blocked two of the hats I made. I’m on a roll, it seems! It might be that I’m gearing up for the Knitter’s Review Retreat, which is happening in just a few weeks. I have lots to do in the stash before I leave — there are many bags to sort so I can bring things to swap in the Stash Lounge, and I have to decide what I’m going to knit while I’m there, and I want to choose a yarn and project to start on Sunday morning. It also might be that I had very good news last week. I’d been dreading my second three-month checkup with Dr. Pearl. Last time there was still some concern about my blood work, so we were being watchful and waiting to see how it would be this time. Well, it was the best it’s ever been. So normal that it’s crazy-normal. The three of us — me, Dr. P. and Nurse Sylvia — were thrilled! I feel like I’ve been doing things right (as in getting healthier), and I can keep going without all the worry. I’m so very grateful to be in the care of this wonderful doctor and nurse, and I’m also very proud of what I’ve done. Oh, and I got my first haircut the other day! I'm so glad your blood work was excellent. Glad you're "back"–blogging, knitting. I think that shawl is gorgeous. The colors are beautiful and it looks like a great match of yarn/pattern. Hooray for the good news from your doctor! And double hooray for haircuts! Yay for good bloodwork!! 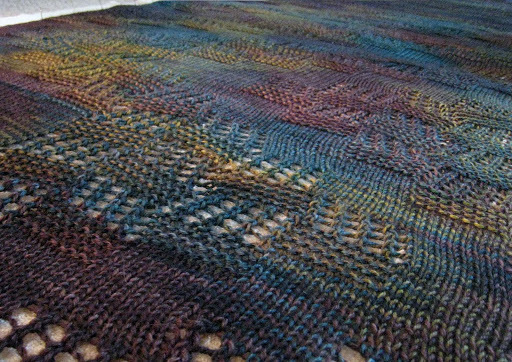 And oh, that shawl is gorgeous – the colors are amazing. I LOVE that! The colors are so beautiful – almost as beautiful as good bloodwork and haircuts! I think it's beautiful! I'm not a knitter but I follow your blog – which I came upon by chance – with great interest. And hey, I am so impressed that you needed a haircut! a stunning shawl, a retreat coming soon, and hairs to cut. oh my! what a grand week of celebration it has been.I am so delighted to hear the news of your healthy blood work. good job, dear friend. You are amazing. And I look forward to reading your lovely thoughts for all the years to come ;-)(which, of course, will be multitudinous)Love love love that shawl. must make me one when the current projects on needles, and committments are fewer. Is that another one in Clara's new book, the pattern you designed?>? Beautiful shawl and beautiful yarn. Looks like it will be both warm and light.Congratulations on your continued (and improving) good health! AND a new haircut! That shawl is gorgeous, Jane. It's making me poke through the stash very excitedly. Congratulations on your excellent news from teh Doc. Yay! Gorgeous shawl!! I used to look forward to reading your blog when you started your journey with cancer(and would worry about you when I wouldn't see a post for a long time!) I was recently diagnosed with breast cancer and was wondering if you a have any suggestions on a hat pattern I could knit before I start with chemo. Muchas Gracias! Have a very beautiful day filled with many blessings! Beautiful Jane, every bit of what you wrote about.